Monolingualism may be the norm in the U.S., but throughout most of the world, kids speak more than one language. [^1] In the past few decades, research has revealed more and more benefits of bilingualism. This has contributed to a resurgence of American parents interested in supporting their children in becoming bilingual, but parents understandably still have many questions. 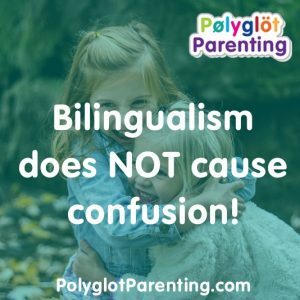 In my experience as a Bilingual Parenting Consultant and Speech-Language Pathologist, a very common concern from parents about raising children bilingual is that the child will be “confused”. Allow me to put your mind at ease. Since different people use the word “confused” to mean different things, I’ll break the responses down into five concerns and address each one in turn. Of course, people do not always have an equal opportunity to become fluent in two languages, just as a child may not have an equal amount of time available to practice both violin and piano. But the mental resources it takes to play violin are not separate from the mental resources it takes to play the piano. It's complementary to know both, and the knowledge overlaps in many ways. Just so with bilingualism. My take is that making an incorrect assumption and then realizing they were incorrect - i.e. briefly encountering a situation that is confusing - is such an incredibly common occurrence for children that I don’t think it’s practical or necessary for parents to make it their goal to avoid or minimize such situations. Monolingual children have to encounter potentially confusing linguistic situations along the way, too. For instance, a monolingual English-speaking child may encounter a person who is monolingual in a foreign language and have a similar moment of frustration. Another common example of language mix-ups that often happen with small children is that they overgeneralize - for instance, they call all four-legged animals "dogs" upon first glance, or they may call all men “daddy” until they figure out differentiated words like “man”, “uncle”, etc. In sum: the answer to "will exposing my child to two languages confuse them?" is that evidence does not support this being a concern. That’s a relief, because over half the world’s population speaks two or more languages, and hopefully most people on Earth are not walking around in a perpetual state of confusion! [^2]: Paradis, J., Genesee, F., & Crago, M. B. (2011). Dual language development and disorders: A handbook on bilingualism and second language learning. Baltimore, Md: Paul H. Brookes Pub. Co.
[^3]: Genesee, F., Nicoladis, E., & Paradis, J. (1995). Language differentiation in early bilingual development. Journal of Child Language, 22, 611-631.